An online slots player named “123jaki” had the luckiest day of her life when she hit the second big jackpot at the new three-dimensional casino, WinADay.com. She was playing Slot-O-Matic, the site’s most popular game – when she won $159,660 (123,620€). This is only the second progressive jackpot win ever at the new 3D casino presented by Slotland.com. The first winner at the unique new site was an Italian player known as “Monica68” who won €116,200 ($148,724) playing Wheeler Dealer. 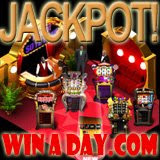 Continually adding new games, WinADay.com currently has six slot machines and video poker games to choose from in its three dimensional Games Lobby. Animated casino staff are available in the Lobby to answer questions and direct players to their game. Slot-O-Matic is the newest game at WinADay.com and has quickly become the most popular. Only last week Slotland.com, the popular online slots and video poker site that operates WinADay.com, wrote a cheque for a record-breaking $211K jackpot win on that site. This time the WinADay jackpot was won on the Slot-O-Matic but all six machines on the site are tied to the same progressive jackpot so it could have been any one of them. The newest game, Slot-O-Matic, is an easy one payline, three-button slot machine while the game that came before that, Heavenly Reels, is a four pay line slot adorned with heavenly cherubs and with angel wings that appeals to strategic multi-line slots players. Gold Boom is a 9-wheel, 6-pay line slot machine that offers free bonus spins and awesome payouts.